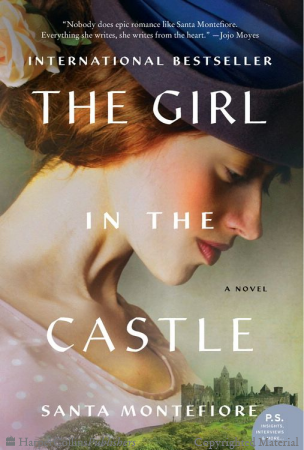 Oh, how I wanted to love The Girl in the Castle, by Santa Montefiore! Set in Ireland, this is the fictional story of Kitty Deverill. The story is set during the Irish Revolution shortly before World War I. Kitty lives with her family at Castle Deverill which has been owned by their ancestors for generations. Although they are Anglo-Irish, Kitty feels more connected to Ireland than England and finds herself essentially between two worlds. The Girl in the Castle is the first in a trilogy of books that Montefiore is planning to write about the Deverill family. This is a great thing if you loved the book and not so great if you aren't feelin' the love. As I say, I wanted to love it but I simply could not. I enjoyed learning more about the history of the Irish Revolution. It was like getting to know the other half of Tom from Downton Abbey and having his political positions explained more thoroughly. It's a time period and situation I know little about which is one of the reasons I was drawn to reading the story in the first place. On the whole though, I could not relax with the book because, aside from Kitty herself, I could not admire a single other character. Montefiore is a conservative writer by modern standards but not conservative enough for my tastes. All of her characters seem bent on destruction in some form or fashion and frequently this involves sexual exploits. It's fair to say that if you've seen Downton Abbey (and I have) you won't find anything more shocking within the pages of this book, scene-wise. Still, it's there and so I found myself having to skim and skip along to get past descriptions that I didn't want to read. The first half of the book is all about character development and in this I enjoyed myself well enough. I was easily lulled into the history of the Deverill family and interested in their outcome. However, by the second half of the book things were much more intense and everyone's life was in almost perfect shambles. There was nothing to love, nor even to like. It was hard for me to finish this book, but finish I did. The Girl in the Castle has many promising things going for it in a spirited leading lady who loves the land she is born into. It's an interesting story from the historical perspective, but when it comes right down to it it's full of dishonorable men and women who care little for doing what is right and more about doing what they want. Some will find my opinion of this book harsh. Some will find it very vague and I'm keeping it that way on purpose because if anyone out there wants to dive into the history of the Deverill family and read this trilogy then I don't want to offer spoilers as to the storyline. In my opinion, the storyline is fascinating. It's the cranky, immoral characters who did me in. Who wants to spend time with a group of people that they cannot in any way admire (or barely stand)? If this were a true history I might suffer through it, but as it is a piece of fiction I'm going to take a pass on it and I won't be recommending it to others. I will say a quick thank you though to William Morrow Paperbacks who sent a copy of this book in order to facilitate a review. I received no additional compensation and if you doubt that the opinions expressed above are any but my own I shall find you very funny indeed. Doesn't sound like my cup of tea, either. I feel like all my reviews sound somewhat like this. The story was great, until all the immorality happened and ruined everything for everyone. Too bad because it SOUNDS really interesting. I recommend that you read this book. I found the characters fascinating, the Irish struggle enlightening, and the story enticing. I can't what to see what happens next.